Updates about the Spiegel Community Center Upgrade, Redesign & Expansion Project. We cut the ribbon on our expanded and completely renovated Paul M. Spiegel Pittsford Community Center on August 25 and are so proud to share it with you! The community center is open this week for fall program registration - please come by and take a look around. Fall Recreation programs begin September 5. The Spiegel Pittsford Community Center now includes a spacious new lobby with street level access and a beautiful new home for our seniors programs. The complete interior renovation provides state-of-the-art amenities and updated infrastructure while preserving the building’s historic character. See our self-guided tour sheet and floor plans for complete details. Town Supervisor Bill Smith was joined by former long-time Town Supervisor and building namesake Paul M. Spiegel at the grand reopening, which included comments by Mr. Spiegel and an open house featuring tours, program demonstrations, history presentations and family activities. The project allowed the Town to move senior programming from rented facilities into the renovated community center. The move will save the Town approximately $100,000 per year and enables expanded programming for seniors, including activities with child watch and youth programming participants. The project was funded by a $9.3 million bond approved by residents in 2017 and Town capital reserve funds. The community center building was constructed in 1916 as the Pittsford School, which served Pittsford children from kindergarten through 12th grade. The Town acquired it in 1973 for use as its Recreation Department. The building was dedicated in honor of Paul M. Spiegel in 1987 upon his retirement as Pittsford Town Supervisor and was rededicated in his honor at the grand reopening on August 25, 2018. The summer months have allowed us to move ahead quickly and effectively on the project. Site work, including parking lot paving, curbing and sidewalk installation, is nearing completion. Site amenities such as benches and bike racks have been installed. Final topsoil restoration and seeding will be underway soon. The new addition is now entirely enclosed and the new elevator has been installed and certified. Drywall, drop ceilings, and mechanicals for the area are being completed. Flooring, painting, and most fixture installations and other improvements have been completed in the renovated portion of the building. All mechanical systems currently are being tested and started. We look forward to sharing our restored and revitalized community center with you. Please do join us at 35 Lincoln Avenue on August 25 at 12:30pm to celebrate our grand reopening. We’re in the “home stretch” of our Community Center Restoration and Improvement project – just weeks away from opening our doors and sharing the beautifully renovated and expanded facility with you. We invite Pittsford residents to our grand reopening and rededication for the Paul M. Spiegel Building Pittsford Community Center to be held on Saturday, August 25. The festivities begin with a ribbon cutting and rededication ceremony at 12:30pm, followed by a community open house with facility tours, program demonstrations, historical information, family activities and refreshments from 1:00 – 4:00pm. Residents will receive a postcard with all the details in early August. The project is on time and on budget. This success comes after years of planning and community engagement that began in 2014, a vote of support by the public in October of 2016, and further input and design development through August, 2017, when construction began. It has been a rigorous, inclusive and thorough process. Be sure to join us to celebrate this milestone event for Pittsford! It has been a busy spring for our community center restoration and expansion project. Work on site improvements - including the parking lot, sidewalk and walkway areas – has been progressing on schedule, as has interior work. Ceiling tile, walls and flooring work is being finished in the renovated areas of the building and work on the new gym floor is underway. New ADA showers and lockers have been installed. 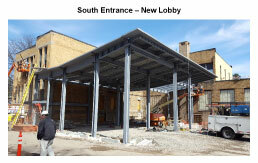 Building exterior work is progressing as well - the walls and windows in south entrance/new lobby area have been constructed. Interior renovations have been progressing quite quickly. Drop ceiling, tile flooring and hardwood flooring work has been underway as of late March. Deputy Town Supervisor Kate Munzinger, Town Board lead for the Spiegel Community Center Restoration and Improvement Project, visited our Senior Center today to give an update on the project. The presentation included a "Pittsford Community Center Tour" slide show with photos of current work in the building. Click the link to see her "Pittsford Community Center Tour" presentation. Foundation work was completed and work began on elevator shaft in mid-February. Structural steel for the new addition is now going up. 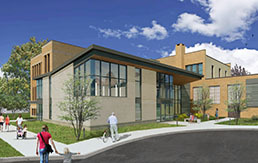 The Spiegel Community Center Restoration and Improvement Project remains on schedule and on budget. Most of the HVAC, electric, plumbing and fire protection infrastructure has been completed for the original part of the building. Drywall installation is complete for the majority of the interior walls; initial primer and paint will be applied shortly. The new roof has been installed on most of the building. Repairs to the existing foundation have been completed and work continues on the foundation for the new addition. Materials for the new playground have been delivered and will be installed once the weather breaks in the spring. The Spiegel Community Center Restoration and Improvement project continues on schedule and on budget. Crews have completed asbestos abatement work on all three floors and the demolition necessary for interior improvements. Exterior demolition for the new entrance is complete as well. Work is underway on site improvements, roof work, and new plumbing/fire protection, HVAC and electric installation. Framing for interior walls will begin shortly. Councilwoman Mary Gehl Doyle, Town Board lead for the Spiegel Community Center Restoration and Improvement project, joined Commissioner of Public Works Paul Schenkel and Recreation Director Jessie Hollenbeck at the Community Center site to assess the project’s progress and reported that construction remains on schedule and on budget. Crews are finishing up asbestos abatement and have begun necessary demolition for interior improvements and creation of the new entrance. Construction crews at the site continue to work on asbestos abatement, selective demolition and minor site improvements. The Spiegel Community Center building is now closed as construction for the building’s restoration and improvement project gets underway. Pittsford Recreation programming will continue at other locations, including the Town’s recently-purchased facility at 5611 Palmyra Road, at the Pittsford Community Library (24 State Street) and the Town’s Senior Center at 3750 Monroe Avenue, and at local schools. The Town facility at 5611 Palmyra Road, located across Marsh Road from the Post Office, will serve as the interim community center. During the Spiegel renovation it will house Town wellness and fitness programs such as karate, ballet, aerobics, yoga and others. It also will house the Recreation Department’s offices. Through our partnership with the Pittsford Central School District, Town After School programs for children in kindergarten through grade 5 will be offered at Pittsford elementary schools: Jefferson Road Elementary, Mendon Center Elementary, Thornell Road Elementary and Park Road Elementary. The Town’s Kindergarten-Wrap program will be offered in collaboration with ArtsROC on Monroe Avenue. The Pittsford Community Library will host babysitter training, academic offerings and seminar-style classes. The Senior Center will be the site of bridge class and Martial Arts for Women, among other programs. The Town Hall meeting room will be available for community group meeting reservations. Programming at these alternate locations will continue throughout the construction period, which is expected to last for approximately 12-14 months. Find updated program information on the Town’s online Recreation Registration and Information page https://webtrac.townofpittsford.org/wbwsc/webtrac.wsc/wbsplash.html. Information about the Spiegel Community Center project is available on the Community Center Q&A web page www.townofpittsford.org/community-center-project/q-and-a and the Community Center Project Updates web page www.townofpittsford.org/community-center-project. The Town has created a Community Center Project Q&A web page addressing specific aspects of the Spiegel Community Center renovation. You can find all the facts and details at www.townofpittsford.org/community-center-project/q-and-a. Town staff are currently packing, storing, relocating items in preparation for relocation during the renovation and construction phase of the Spiegel Community Center project. The Spiegel Community Center building will be closed from Saturday, August 19 until completion of the construction. Recreation programming will continue at off-site locations during the Spiegel construction. A public information meeting with large-scale poster boards of the Spiegel Community Center project was held at Village Hall. 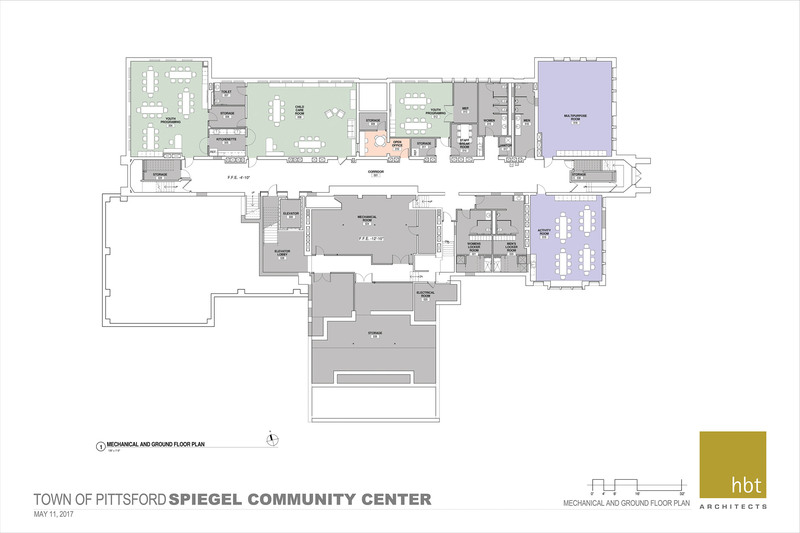 With the construction phase of the Spiegel Community Center Restoration and Improvement Project expected to begin in September of this year, Town staff have spent the last several months planning for the temporary relocation of as many Pittsford Recreation programs as possible. Room reservations at Spiegel will end June 25 as we’ll begin pre-construction preparations; rooms will no longer be available for community group reservations after that date. August 18 will be the last day we present programs in the Spiegel Community Center. At that point the building will be closed until its reopening following renovation. Recreation programs will continue off-site, throughout the renovation of the Spiegel Center. As we confirm details for off-site programming during Spiegel’s closure you’ll find them on the Town website, in our weekly eNews and in the Fall issue of our Recreation Brochure. We’ll also post notices in the Spiegel Community Center prior to its closing. If you have any questions about Town Recreation programs or room reservations at the Spiegel Center, please contact the Recreation Department at (585) 248-6280. Updated floor plan and site plan renderings have been added to the Town website; click the links listed at the top of the page to see them. The project architects are working on design development for the building addition and the site plan, including landscaping. Once these designs are formalized, they will be posted on the Town website and a public meeting will be scheduled to obtain resident comments. Until then, public comments are welcome at any time – please direct them to Town Board member Mary Gehl Doyle, the board liaison for the project. You may reach her at mgdoyle@townofpittsford.org. Councilwoman Mary Gehl Doyle confirmed to the Town Board at their March 21, 2017 meeting that the proposed plans for the Spiegel Community Center renovation project will include a generator, which had been under consideration previously. She reiterated previously presented information about the exterior and interior schematic design plan details and again showed the current exterior and interior schematic design renderings for reference. 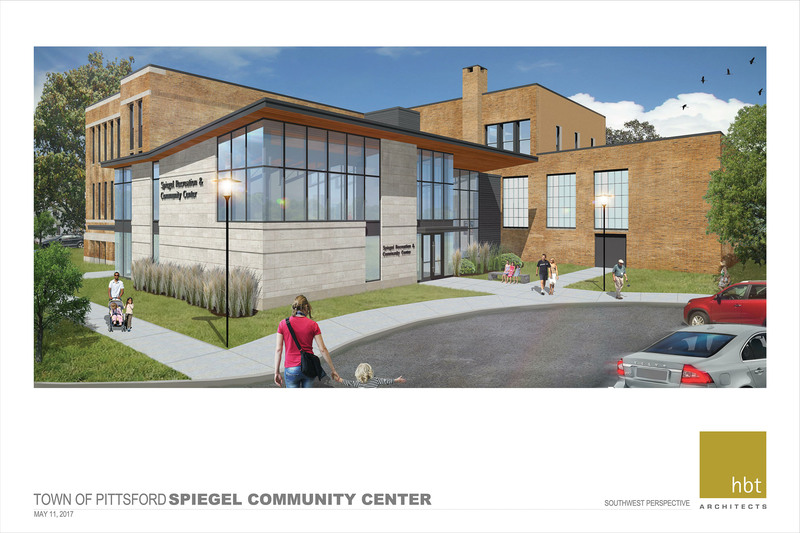 Councilwoman Mary Gehl Doyle presented an update to the Town Board at its March 7 meeting regarding the status and progress of the Spiegel Community Center renovation project. She noted that the intention is to create a community center, as opposed to a recreation center, and presented exterior and interior schematic design renderings. While presenting a rendering of the building exterior, Councilwoman Doyle discussed the planned exterior renovations and the 2,600 square foot addition to the building. She also presented and discussed interior floor plan drawings; see the March 7, 2017 Town Board meeting minutes for an outline of the plan details discussed. Members of the Spiegel Community Center renovation and expansion project team met on 1/19/17 to review the timeline for the project. The team includes Town Supervisor Bill Smith, Town Board member Mary Gehl Doyle (the project point person for Town Board), Recreation Director Jessie Hollenbeck, Commissioner of Public Works Paul Schenkel, and members of the project’s construction management and architect/engineering firms. The group will continue to meet regularly to ensure the project remains on schedule as we move forward. At its 12/20/16 meeting, Town Board approved HBT Architects as the architectural and engineering firm for the Spiegel Community Center renovation and expansion project. The project team continues working on plans for temporary relocation of our recreation programs during the construction period. At its 11/15/16 meeting, Town Board approved DGA Builders as the construction management firm for the Spiegel Community Center renovation and expansion project. We are in the process of engaging a construction manager and confirming the architects and engineers for the project and expect to have them in place by the end of November. Design development will take place over the winter and is expected to be completed in March, 2017; construction documents then would be developed and a request for construction bids issued, potentially in the summer of 2017. If this timeline holds as we move forward, we would expect to have the contractors selected sometime in September 2017, with construction possible to begin in September or October. We can expect construction to take a year. A project this extensive requires closing down the community center for a period of about a year for construction work. During this time we will continue to offer Recreation programs; we plan to obtain temporary space for as many as possible of our community programs currently offered at Spiegel. We will provide continued updates and details about our program offerings on the Town’s website, Facebook page, and Twitter feed, as well as through Town and local media publications. 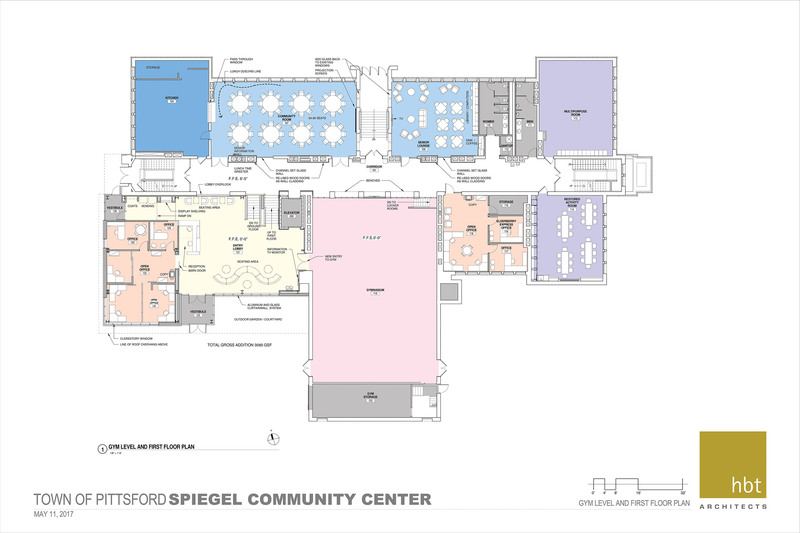 October 18, 2016 - Town of Pittsford residents voted to approve $9.3 million in bond financing for the Town’s Spiegel Community Center upgrade, remodel and expansion project in a referendum held Tuesday, October 18. The unofficial vote count was 1,650 Yes (69%) and 739 No (31%). 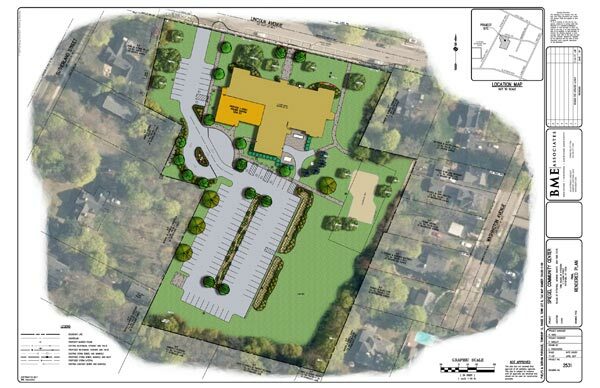 “We worked very hard to come up with a proposal that would give us the community center our residents need and deserve,” said Mary Gehl Doyle, Town Board member and board liaison for the project. “This option is a creative and well thought-out solution – an exciting opportunity to completely transform our Spiegel Community Center” she continued. Pittsford Town Supervisor Bill Smith commented, “The Town Board and I undertook more than a year of preparation and study, including working with a citizen's committee and with our architectural and engineering consultants, Passero Associates. Based on that work, we made a recommendation we believe to be reasonable and principled. It was important to us to know that our fellow-residents consider it reasonable as well. They gave us their answer today." 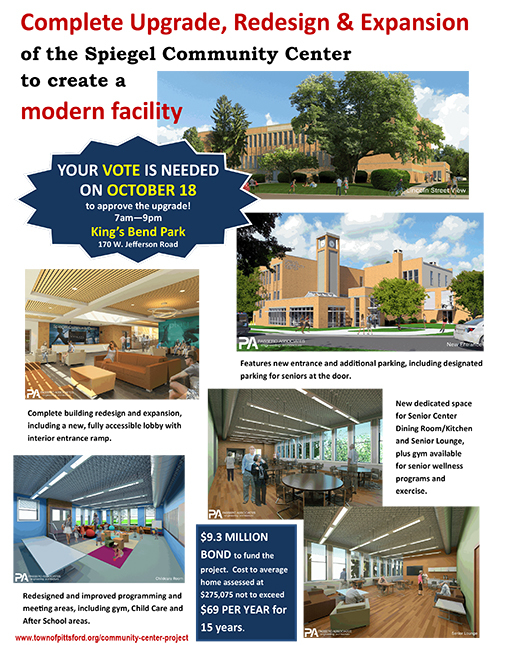 August 17, 2016 - The Pittsford Town Board has set a public referendum date for Tuesday, October 18 to enable residents to vote on the board’s proposal to bond $9.3 million to finance the renovation, remodeling and expansion of the Town’s Spiegel Community Center located at 35 Lincoln Avenue. The decision came at the board’s August 11 meeting. The referendum vote on the project funding will be held from 7AM – 9PM at King’s Bend Park (170 Jefferson Road). Ongoing updates about the vote and the project will be posted here on the Community Center Project page. 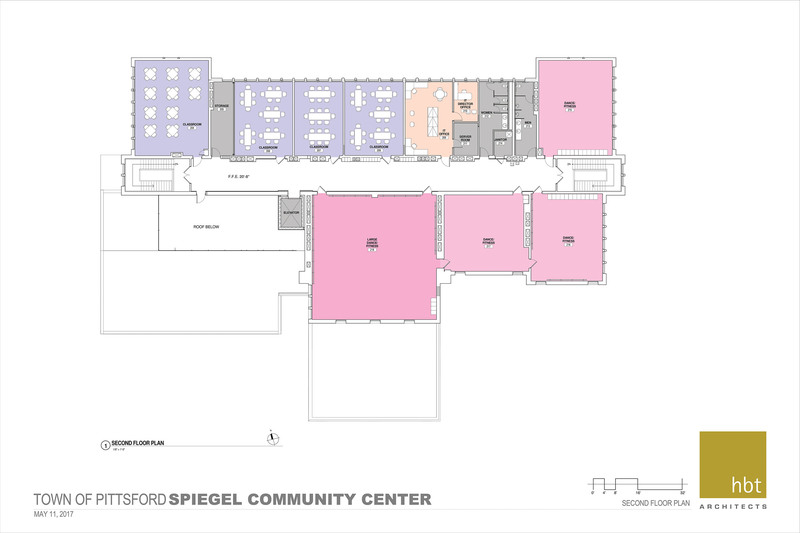 July 20, 2016 - The Pittsford Town Board has released a report recommending a complete renovation of the Spiegel Community Center. The report concludes that renovation is the most cost-efficient and desirable option to provide the community with an attractive and functional facility able to accommodate current and future recreation programming needs. VIEW THE REPORT HERE. The Town Board will schedule a referendum for later this year to obtain public approval for funding the project. 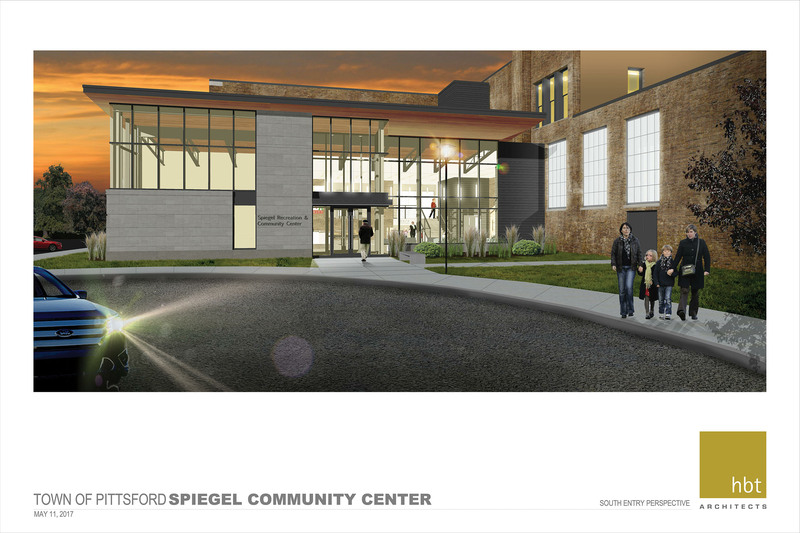 The $9.2 million Spiegel Community Center renovation would cost $69 per year over the next 15 years to the owner of a home of average assessed value; the average assessed home value in Pittsford is $275,075. Current Effort began in 2014. Average assessed value in Pittsford is $275,075.